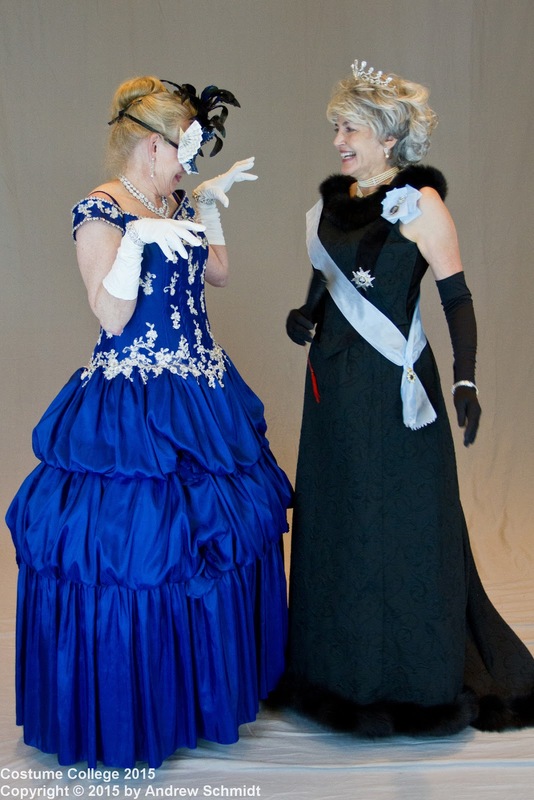 Recreating historical garments and historical research seem to be an inseparable duo. It's most impossible for me to start research into the fashion and accessories of the time period I am attempting to recreate without learning the culture, trends, and historical events of that time. Most of my family has passed leaving behind little information as to their lives and nothing of their possessions. I am a combination of many cultures with my grandparents coming from several countries. While I never had the chance to meet my paternal grandmother I have seen a picture when she was quite old, and as I have aged I see the strong resemblance. 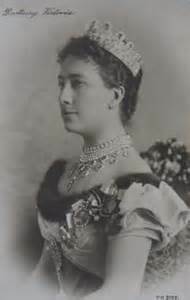 She came to the United States from Sweden and it is in her honor that I researched what the royalty of her country would have been for her as a child in that country. When is comes to heirlooms and heritage we cannot dispute that the royals know the deep meaning of tradition and pageantry. The royal families of the United Kingdom, Norway, Sweden, Denmark, and Tonga have similar practices in the orders and medals they use. Sweden's Queen Victoria, 1862 - 1930, was my inspiration for a gown I recreated. 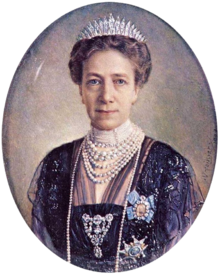 She was born Viktoria and changed her name to Victoria when she became Queen by her marriage to King Gustav V.
In current royalty, Crown Princess Victoria is in this photo and according to my research, she could be wearing a necklace created from the stomacher jewel that Queen Victoria is wearing in the photo above. In 1892, Queen Victoria might have worn a similar gown to this plate from Harper's Bazar, January 2nd. This photo of Queen Victoria shows a similar style with a fur trim and may have been around 1892 as she would have been 30 years old at that time. 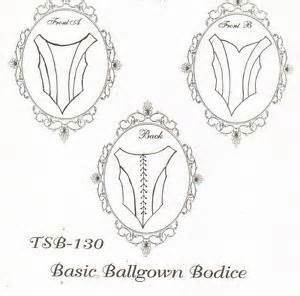 Since I have a skirt appropriate for the era that I have used for several other gowns, I will reuse the skirt once more and I create a bodice from Timeless Stitches TSB-130 Basic Ballgown. I use scraps of the matelassé fabric used for the skirt, and velvet inserts for interest. The bodice neckline and skirt hemline are trimmed with fox fur and a nice sparkle to the buttons will give it a royal feel. 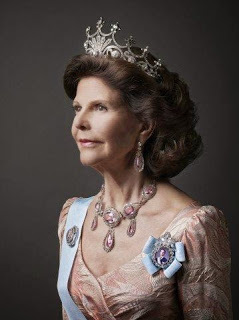 The beautiful part of what the royal family of Sweden shares is the heirlooms and heritage of their Royal Family Order, badge, star, and sash. 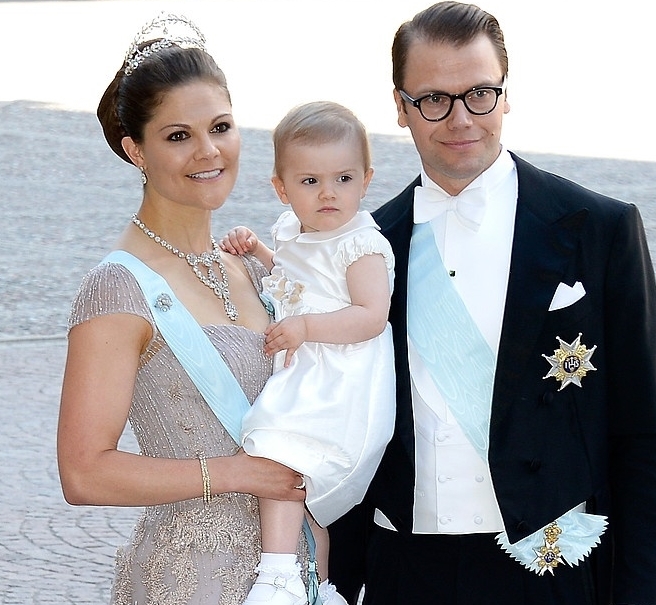 This is Crown Princess Victoria wearing the appropriate pieces. On her upper left side nearest her shoulder she wears the Royal Family Order. It is an order awarded by the sovereign of a monarchy to female members of the royal family as they typically do not wear the commemorative medals worn by the men. The order is more of a personal memento rather than a state decoration although it can be worn during state occasions. Oscar II is the earliest known Swedish king to present female relatives with a miniature portrait of himself surrounded by brilliants. In Sweden the portraits are known as Kungens miniatyrportratt, literally, The King's miniature portrait. 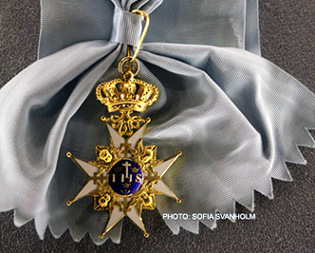 This is a close-up with a portrait of King Gustav V.
The Royal Order of the Seraphim (Seraphim being a category of Angels) is a Swedish order of chivalry created by King Frederick in 1748 together with the Order of the Sword and the Order of the Polar Star. The order has only one class with the dignity of Knight, Member for women, and Member of the Cloth for clergymen. When originally instituted the knights of the Order were required to supervise the major hospitals and mental asylums in Sweden, and in particular, the Seraphim Hospital which was a major hospital in Stockholm until it closed in 1980. During the course of the 19th century this requirement died out. Since the reorganization of the orders in 1975 the Order of the Seraphim and the Order of the Polar Star are only awarded to members of the royal family, however, the order can also be conferred upon foreign citizens such as heads of state and members of foreign royal families. The ribbon or sash of the Order of the Seraphim is pale blue, referred to as seraphim blue. 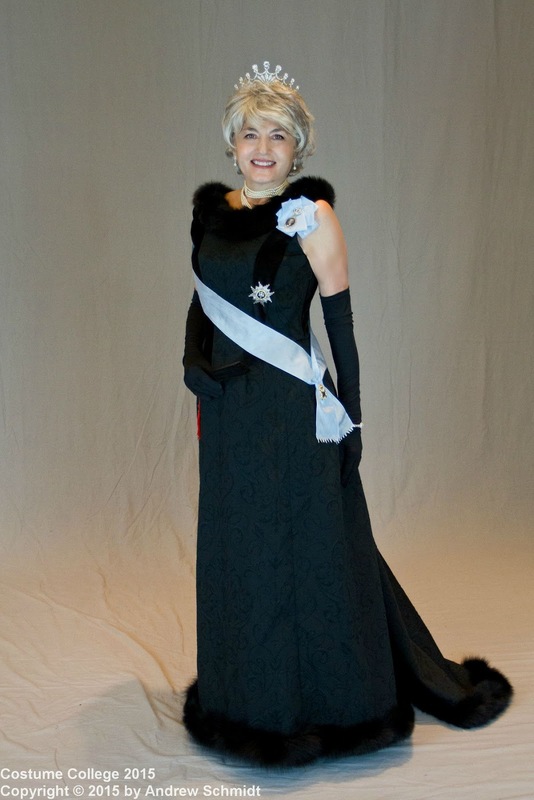 The badge of the order hangs from the sash. It is a white-enameled gold Maltese Cross with a gold patriarchal cross on each arm of the cross and gold seraphim between the arms of the cross and framing with their wings the central medallion. The badge hangs from a gold and enameled royal crown. 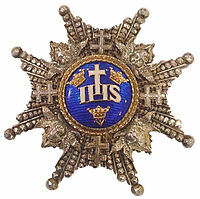 The star of the order, also worn on the left side, is the same as the obverse of the badge without the royal crown, except that the star is entirely of silver and only the central medallion is enameled. In honor of my family, my paternal grandmother, and her home country of Sweden, I set out to recreate a similar impression. 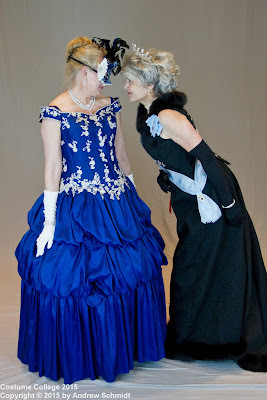 And created a set of Royal Family Orders with my husband as the monarch of our family. With a blue moire sash and similar badge and star, I am ready for the Gala and Red Carpet Presentation at Costume College 2015. How historically accurate is it? Very close for the correct impression with due respect. 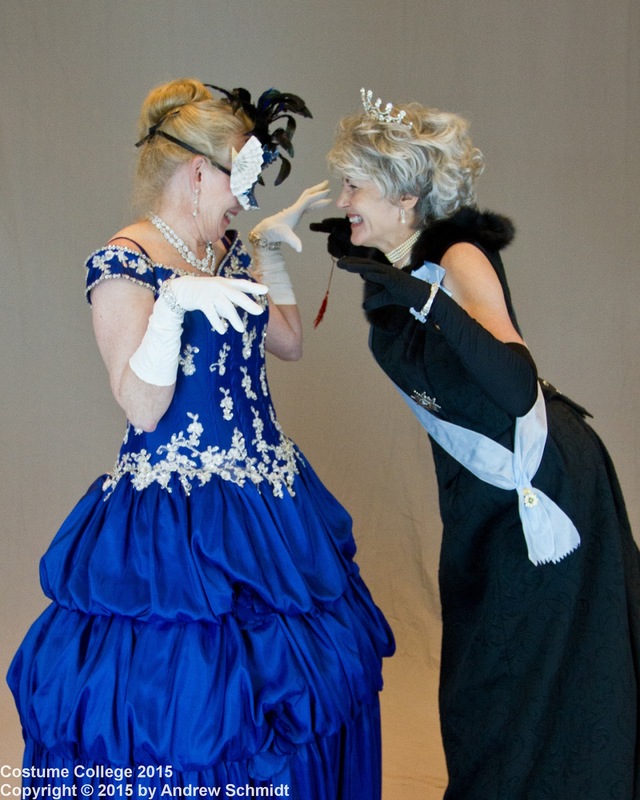 A little Costume College fun! I hope you have enjoyed this bit of history and recreating! Your orders turned out so lovely Jeanette! And I have been watching that tiara for so long! Need to sell something so I can get one! hahahahaha!!! The close up of your dress makes it so easy to see the texture! Gorgeous and I love the fur! So very well done! Thank you so very much, Gina! You know you were (and probably always will be) my inspiration!! You make a fabulous queen! Thank you, Hana - Marmota! Such a fun project!